How to find a deeper connection to yourself and the world around you by using the moon. Understanding and connecting to the lunar rhythms is a graceful and grounding way, to reconnect to nature and shine a light on your own inner cycles. For eons the moon has been a great source of celebration, viewed as the feminine planet she embodies the epitome of grace, deep inner wisdom and intuition. She is the ruler of our emotions, our deep thinking patterns and our sub-conscious. The days leading up to, and on the full moon, can feel very intense and cause some disruption in our lives. This tends to make us feel extra emotional, resulting in feeling more tired and scattered. Taking time to honour the moon with rituals and habits can be a great way to be in touch with your own cycles and rhythms. After time you’ll begin to witness the similarities between your phases and that of the moon; most obvious is both are in constant flux. The new and full moons are especially potent times in the calendar. These phases gift us with amplified intuition. When our intuition is heightened by the moon, we can use this energy to make sharper more sophisticated decisions and choices. Moving us forward in accomplishing our deepest desires. Here are a few simple ways that you can connect to the lunar cycles and use the energy to magnify your life. Here are the four distinct phases of the moon. The new moon marks the beginning of a new cycle, it is invisible, a blank canvas. Making it the perfect time to start fresh and set new intentions. The sky is dark, full of potential and infinite possibilities. Use this phase to get clear on what you desire and what new opportunities you want to invite into your life. Journal prompt: ‘I am … and I have…’ (its important to write your intentions as if you already have it or live it- for example change ‘ I want to start my _____ business’ to ‘ I have a successful _______ business’. The power of your intentions begins with your words). Now the moon is half illuminated and half shadowed. This is the time to take action, do the work necessary to foster the intentions you’ve set during the new moon. This is a time of strength, hard work and dedication. This phase is a good time to launch new projects, implement healthy habits and push yourself to do the challenging work required to accomplish your dreams. Journal prompt: What else can I do to commit to my goals? The moon is fully illuminated. Her light shines down upon us from sunset to sunrise. This is the phase for celebration, to look back at your new moon intentions and review them. Our energy, power and intuition are the strongest around the full moon, so make choices that fuel your intentions. This is also a time to dream big, believe that anything is possible and build on what you have already achieved. Emotions are heightened during this time, so be gentle and show yourself plenty of compassion. Journal prompt: What am I grateful for? – Gratitude puts everything into perspective. The waning moon is all about releasing. Letting go of what no longer serves you, cleansing and breaking free of toxic habits and/or relationships. This is the phase to make space for what you want to call in on the approaching new moon. The perfect time to go inward, to meditate and to take some alone time. It’s also a potent time for forgiveness of self and others. Journal prompt: What no longer serves me? Name it. Tame it. Let it go. 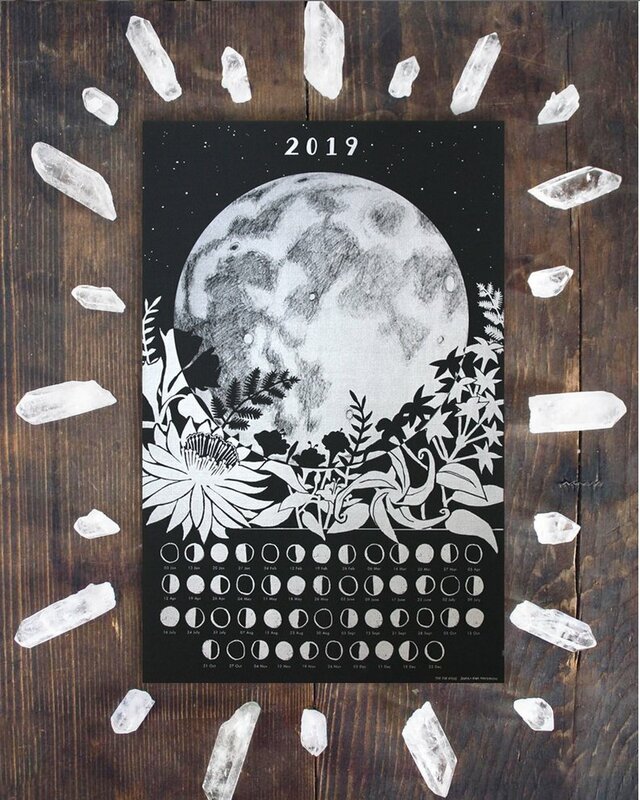 You can buy, download or create your own moon calendar. You can also go through your day planner and record all the new moons and full moons for the whole year. If you want to take it a step further, use the journal prompts above and start a habit of writing a few sentences down according to the phase of the moon. It’s simple, easy but a very effective way to begin to harness the moons energy and get clear on what you desire most. Creating rituals around the moon doesn’t need to be time consuming or complicated. One that I enjoy is every new moon I write down two to four clear intentions- always writing as if I already have it – then stepping outside and burning the piece of paper. Once an intention is set, let it go. Holding on tightly to intentions just creates tension, once you’ve set the intention then give it space to grow and expand. Don’t grip it and suffocate it. When the moon is full I like to write down a few heartfelt words. Words that I would like to invite more of into my life – intuition, courage, community anything that first comes to you – then place it in the window for a few days over the full moon. My words are then bathed in the moons light, receiving an extra boost of energy. Meditate. You can choose from a plethora of guided mediations online; I suggest finding a guided meditation for ’letting go’ to practice on the full moon and a ‘manifesting’ meditation for the new moon. If you prefer not to listen to guided meditations then follow these four easy steps. 1. Light a candle or two and put some peaceful meditation music on, being in complete silence is also fine. Find a comfortable position – you can lie down, be in a chair or cross legged- make sure you’re in a place you won’t be disturbed. 2. Once comfortable, close the eyes and begin deepening the breath, making both inhales and exhales long and smooth. Don’t strain to make the breath deeper, ease into it gradually. Find a deep effortless breath. 3. Visualize a golden light entering through the center of your forehead (third eye) on the inhale. Move the light down through the body to the heart center, all the way to your solar plexus (bellybutton) on the exhale. 4. Repeat this circle of light for as long as you like. This meditation is calming and clearing. Practice it on both the full moon and new moon. Practice yoga. Moon salutations or ‘Chandra Namaskara’ as known in Sanskrit, are similar to the more well-known sun salutations, however consist of a different set of poses. The moon salutation sequence is intended to be softer and less focused on building heat and energy. Rather the aim is on quieting down, calming the mind and moving with greater intention. The sequence beautifully mirrors the moons shape and is practiced as a continuous circle. So you choose how long you want to practice for. Click here for an example. Bonus: people to follow on Instagram for moon/astrology updates, inspiration and suggestions. By following the moons cycles and using the energy of each phase, I’ve found that my weeks and months have become more productive and focused. By setting intentions on the new moon, I’ve discovered I have far more clarity around my goals. Therefore reaching them has become easier. When the full moon rolls around I make sure I celebrate what I have done. Whether big or small, I still make a point of highlighting and honouring them. I encourage you to begin small, start with being aware when the full and new moon is and simply take note on how you feel. Build on this by writing and reading more, because the moon shifts through different astrological signs every two days; bringing with it certain qualities to work with. Over time you might want to create personal rituals of yoga and meditation, or even attend a moon gathering/ceremony. Whatever you choose to do to honour the moon, you will feel more connected, grounded and inspired.